Sat 12/22, 730pm (doors at 7) — Klezmer at Kenyon Hall, 7904 35th Ave SW, Seattle, WA 98126. 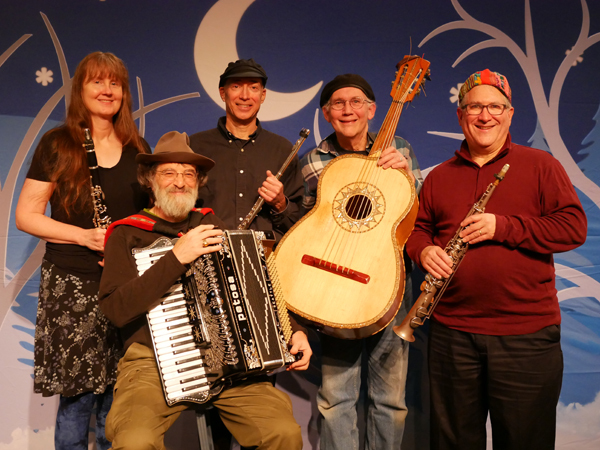 Kenyon Hall in West Seattle welcomes back the Klez Katz, bringing their merry assortment of freilachs, shers, waltzes, bulgars, terkishes, and Jewish liturgical songs to help you dance away those post-holiday blues. Hanukkah comes but once a year — or does it? Tickets and Reservations: Front reserved table seats are $14. Row seating is $12 general and $10 seniors. With a reservation, row seating is only $10 general and $8 seniors. Elementary, middle, and high school students are $5. Cash and checks are accepted at the door, and doors open at 7 for the 7:30 show. To make a reservation, please e-mail kenyonhall@earthlink.net. You'll receive an e-mail confirming your reservation.